Training for volunteers, facilitators, shared experience representatives and people keen to learn leadership skills. You may already know heaps and need a refresher or you might not know anything and get to learn new and fabulous ways to facilitate groups, tell your coming out story in an education session and be a great volunteer for Rainbow Youth. 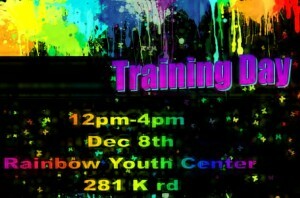 If you are coming to the training but then cant let us know asap so others don’t miss out.